Most of the holiday food traditions in my family seem to involve oranges. October through January is citrus season in southeastern Louisiana, or at least in my parents’ garden, so both Thanksgiving and Christmas are celebrated with plenty of citrusy dishes like ambrosia, cranberry relish (with raw orange peel included), lemon pies, and wassail. During the holidays my mother often brews up a pot of wassail, and I grew up hearing the word and associating it with both her hot, spiced tea and orange drink and with the first line of the carol, “Here we go a-wassailing.” I thought it had something to do with caroling, but I didn’t really give it a thought beyond that. As it turns out, wassail as a noun and a verb has a long history in England, predating the celebration of Christmas, and has virtually nothing to do with tea or even oranges. I think of my version of wassail as “New World” because instead of wine or ale, I’ve used fruit juices, including juice from cranberries, a North American ingredient that wasn’t available in Europe until the 1800’s. 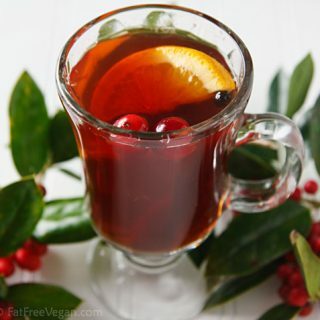 I’ve left out the tea that my mother uses–as well as the generous amount of sugar that she adds to sweeten it–and stuck to 100% juice: apple juice or non-alcoholic cider and a cranberry juice blend that does not contain added sugar. 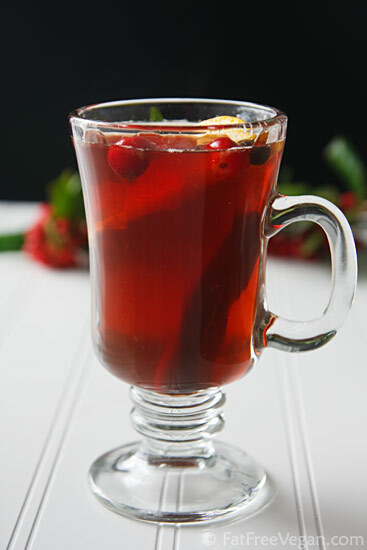 A handful of cranberries brightens up the color and long simmering brings out the spices, while a little brandy added at the end, if you like, carries on the tradition of wassail as an alcoholic drink. If you’re interested in the long and varied history of wassailing, there’s plenty of information be found in Wassailing Through History and in this Wikipedia article. And, if you’re interested in more traditional types of wassail drinks, check out the spiced brown ale recipe at Accidental Hedonist or the Madeira and ale version by Alton Brown (which contains eggs and gets a bad review from at least one blogger). Wassail, everybody! And Happy Holidays! Place all ingredients except the brandy in a large, non-reactive pot or crockpot and bring to a low boil. Reduce the heat to the lowest setting and cover. Simmer for at least 2 hours (may be kept in a crock pot for 4 hours). About 15 minutes before serving, add the brandy and continue to simmer on low. Strain out the spices and fruit and serve with cinnamon sticks and fresh slices of orange. Nutritional info includes 1/2 cup brandy. My goodness. This sounds fabulous, and is now on my to-do list for tomorrow. Susan, I've been following you for awhile now, and thought I would finally comment. I've recently been accepted to Teach for America and am coming to the Delta in June to live and teach for a couple of years. I do have a little leeway in where I am sent (not much but a little). My question is: do you find it for the most part easy to be vegan in Jackson? I'm looking at either Jackson, or somewhere close to Memphis. Thanks for any insight! p.s. I made your Chickpea and Turnip Ethiopian Stew today. Sooooo tasty. Thanks for all the recipes over the years! Liv, I'm so happy to hear you're coming here to teach. To answer your question, Jackson has great places to buy ingredients as does Memphis, but Memphis has more vegan-friendly restaurants. Anywhere in between will be much more difficult. As long as you're close enough to one or the other to come in to shop periodically, you should be okay, though you probably won't run into many fellow vegans. Good luck! I'd love to hear from you after you're here. Wow, you must have been reading my mind…Alton Brown did a wassail episode tonight and I was wondering if it was possible to healthify it up! This sounds delicious, and much more appropriate in our freezing cold weather than the cold punch that is the traditionnal holiday drink here! I've got to give it a try and see if I can start a new tradition in my family! This is really interesting! 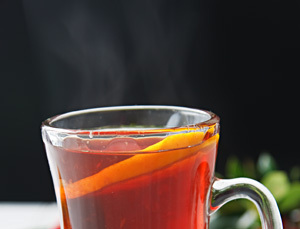 I've never heard about wassail before but it sounds almost identical to a traditional Finnish Yule drink called glögi. Here's how I usually make it. I've posted some variations of it lately as well. Hi! I just have a question before making the recipe: What is natural cranberry blend drink? Is it the same thing as cranberry juice made from concentrate without added sugar? Mathiew, the cranberry blend drink I used is a combination of cranberry juice and other, sweeter juices such as pear, apple, and white grape. Straight cranberry juice might be a little too tart without adding some kind of sweetener. You could always use less of it and more apple juice to balance out the sweetness. I jumped over from tastespotting upon seeing this fabulous drink (and the wonderful photos) Lovely! What a lovely blend! I love the stunning colour of it, yet it's really nutritious drink! I posted up a wassail recipe, too! it's definitely a winter drink that brings back good memories! hello from Austin! My grandma makes it like this, minus the ginger. It's one of my favorite parts of Winter. It's also good with a bottle of red wine added, instead of the brandy. I'm going to add some ginger to our next batch, I love the stuff so I'm sure it will make it even better. Hi! new to your blog and I love it! currently roasting an eggplant as we speak to make the creamy creole casserole! I saw this wassail post and was intrigued! I've seen wassailing once, as it is done in england and what they do there is dunk bread into apple cider (the alcoholic proper stuff) and the womenfolk put the bread in the branches of the oldest tree in the cider apple orchard and pour the rest of the cider at the base of the tree and bang pots and pans around the tree and orchard crying out wassail to scare away bad spirits and encourage a good crop! I made this for a holiday party this past weekend and boy, did it go over well! I should’ve doubled the recipe – lots of sad faces when I had to admit the punch was gone. This drink looks very delicious and healthy. It is very new to me. I’m trying this later. Thanks for the recipe.